This Summer Breeze Full Mates Bed in a Blueberry Wash is a perfect choice for children, teenagers or even young adults bedroom that is looking for a country style. It is an economic option since it does not require a box spring. It features 3 practical drawers equipped with plastic slides and antique wooden knobs. Fits perfectly with the Summer Breeze Full Bookcase Headboard for a complete bed. It is reversible so the drawers can be on either side. Weight capacity is 500 lbs. Also available in White Wash or Chocolate finish. The interior drawer dimensions are 22-3/4-inch wide by 18-inch front to back. It measures 56-inch wide by 76-1/4-inch long by 14-inch high. It is delivered in a box measuring 82-inch by 20-1/2-inch by 5-1/2-inch and weighing 145 pounds. Mattress and accessories not included. Manufactured from certified Environmentally Preferred laminated particle panels. Complete assembly required by 2 adults. Tools are not included. 5-year limited warranty. Made in Canada. Also available in White Wash or Chocolate finish. Mattress and accessories not included. Weight capacity is 500 lbs. It is reversible so the drawers can be on either side. The Spectra collection offers you this spacious full 54-inch mates bed with its Solid Black finish. It features 4 spacious drawers, 2 on each side, offering ample storage for a large variety of items. Flat fitting metal handles with a satin zinc finish accentuate the modern design, while adding protection.. This bed fits full size mattress and box spring is not required. Can be used with the Spectra full bookcase headboard to form a complete ensemble. Drawer interior dimensions: 22-1/2-inch wide by 17-1/4-inch front to back. Also available in Pure White or Chocolate finishes. It is made of recycled CARB compliant particle panels. The glides are made of polymer and include dampers and catches. It has to be assembled by two adults. Measures 76-1/4-inch long by 59-1/4-inch wide by 13-3/4-inch high. It is delivered in one box measuring 82-1/4-inch by 21-1/2-inch by 7-1/4-inch and weights 146 pounds. Tools are not included. 5 year warranty. Made in Canada. Wipe clean with a dry cloth. A sleek, contemporary style bedroom set! It helps you create the modern or eclectic decor you want, and the drawer in the footboard also gives you some handy storage space. Combining beauty and the practical will never be so easy! This Imagine TV stand / Storage Unit in Pure White finish is versatile, featuring 2 large drawers with satin nickel metal handles that are perfect for storing clothes or toys, and 2 easy-access open storage spaces ideal for electronics with holes for wire management. Place it under the Imagine loft bed or elsewhere in the bedroom for additional storage. Create an entertainment area any child would love by placing a TV on top (up to 42-inch) and game consoles in the open compartments. The interior drawer dimensions are 35-3/4-inch wide by 14-1/4-inch front to back and are equipped with metal slides for smooth gliding. The dimensions of the 2 open spaces are 16-1/2-inch wide by 16-3/4-inch deep by 6-3/4-inch high. Accessories not included and the back is not laminated. Summer Breeze Collection Full Storage Bed (54'') Blueberry This Summer Breeze Full Mates Bed in a Blueberry Wash is a perfect choice for children, teenagers or even young adults bedroom that is looking for a country style. It is an economic option since it does not require a box spring. It features 3 practical drawers equipped with plastic slides and antique wooden knobs. Fits perfectly with the Summer Breeze Full Bookcase Headboard for a complete bed. It is reversible so the drawers can be on either side. Weight capacity is 500 lbs. Also available in White Wash or Chocolate finish. The interior drawer dimensions are 22-3/4-inch wide by 18-inch front to back. It measures 56-inch wide by 76-1/4-inch long by 14-inch high. It is delivered in a box measuring 82-inch by 20-1/2-inch by 5-1/2-inch and weighing 145 pounds. Mattress and accessories not included. Manufactured from certified Environmentally Preferred laminated particle panels. Complete assembly required by 2 adults. Tools are not included. 5-year limited warranty. Made in Canada. 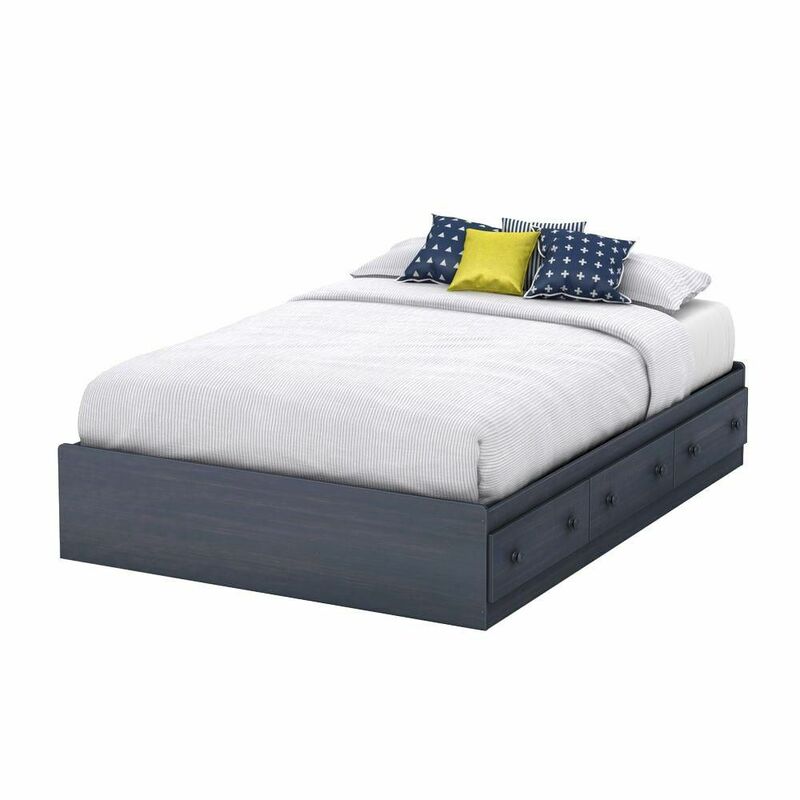 Summer Breeze Collection Full Storage Bed (54'') Blueberry is rated 5.0 out of 5 by 1. Rated 5 out of 5 by Simone0622 from Love it! The bed was easy to assemble. The color is beautiful! I'm very happy with this bed!!! !